Arizona SunScreen offers a full range of products. To view screen and frame colors and specifications, CLICK HERE. We can rescreen your existing insect screens, or we can create new ones using aluminum frames and corners which are available in a variety of colors. For the do-it-yourselfer, we sell screening supplies in our retail store. Have bright sun streaming onto your patio in the morning or afternoon, making it too bright to enjoy? 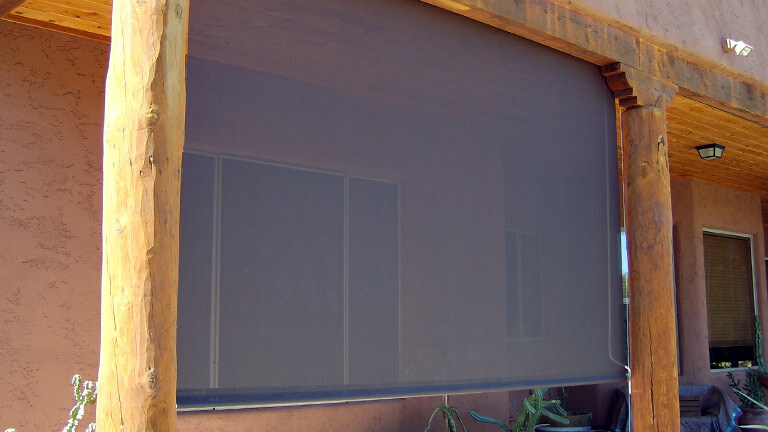 Patio roll up screens can provide shade or privacy for you when you need it, and roll up when you don’t. They also can reduce wind to make your patio more comfortable on those windy Arizona monsoon evenings. We offer a variety of colors and pull styles, including chain pull, rope pull, or crank. We can help you make the best choice for your needs. You also have a choice of various materials and colors. This is a specialty of ours. There is many different reasons our customers have their patios screened. It may be to allow pets out on the patio or to keep birds, leaves and insects from coming in. Your screen enclosure can be screened with heavy duty insect screen or 80% sun screen. All enclosures are customized to suit your needs. The ideal screen solution for today’s every-opoular bi-folding, lift-n-slide and other large opening doors and windows. Featuring one large viewing panel, this is a real attention getter. 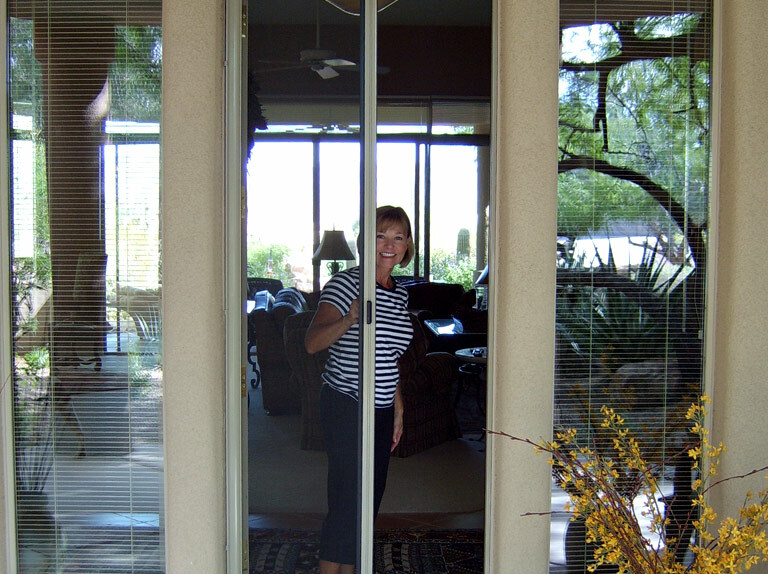 We offer traditional screen doors for patio doors. 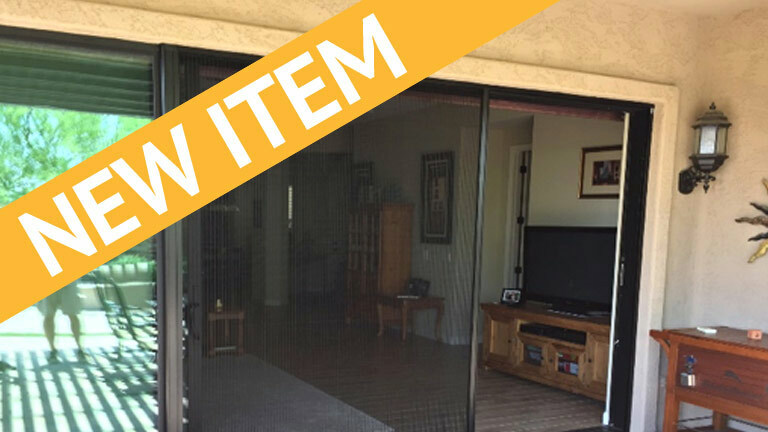 Upgrades can include pet screens, heavy duty frames, and sun screens instead of the traditional insect screen. Swinging screen doors are useful for single width doors. Upgrades can include pet screens, heavy duty frames, and sun screens instead of the traditional insect screen. 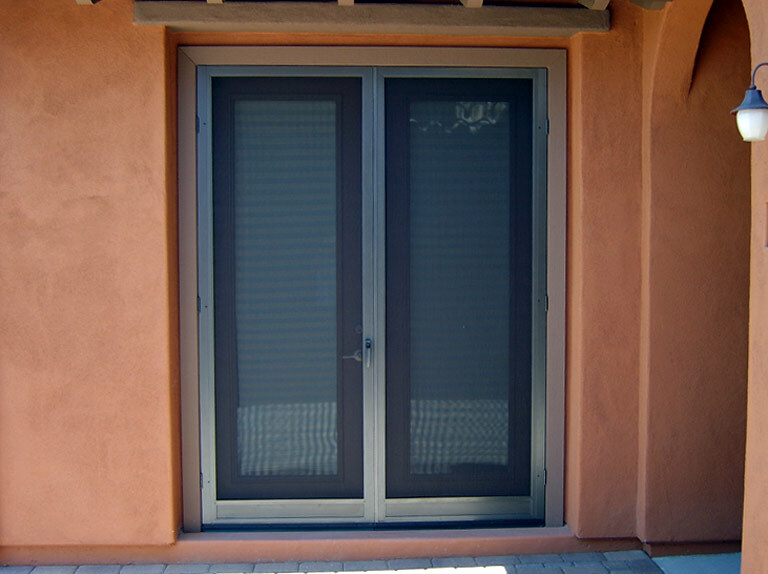 We offer a selection of high quality aluminum screen doors manufactured by Active. You have options of the type of screening material depending on your needs. We do custom sizes and professionally install your screen door. 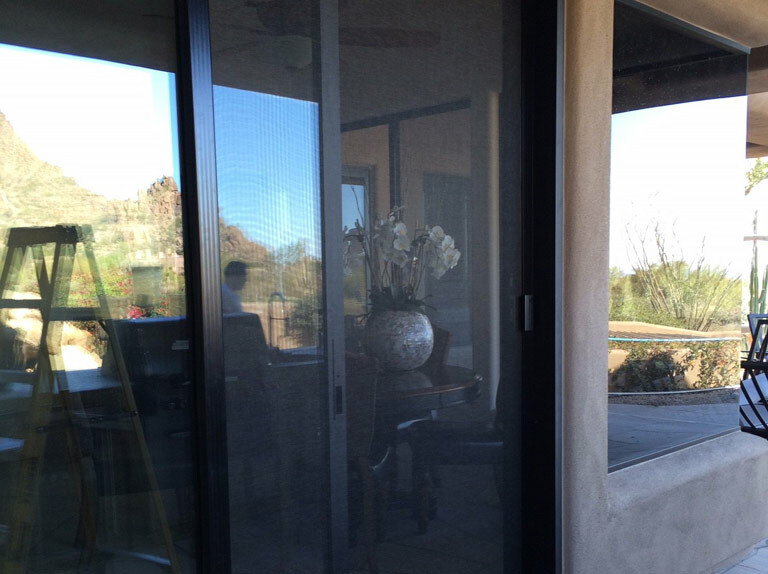 Retractable screen doors are there when you want them, gone when you don’t. They are also great for doorways with clearance problems or a door that swings out. If you enjoy the functionality of a screen door, but do not want to use the screen all of the time, or do not want to obscure the beauty of a beautiful door, retractable screen doors make a wise choice. Increase circulation in a master bedroom with a single patio door. Or allow more airflow into the garage by screening a side garage door. 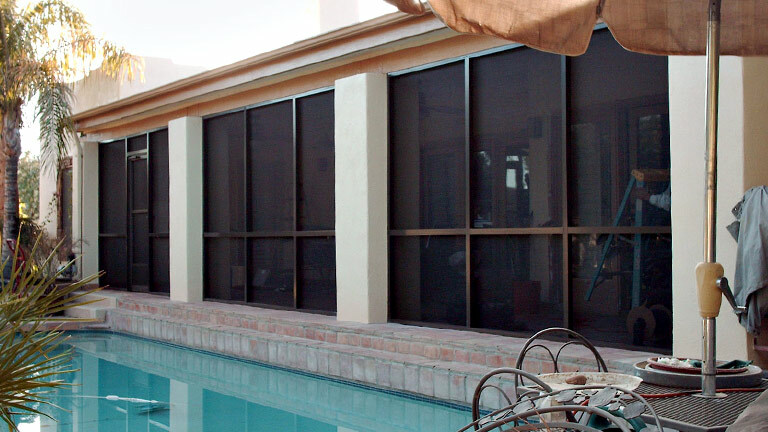 Our retractable screens come in a variety of colors, and their innovative track keeps insects out of the top and bottom of the screen. We offer a variety of other screen products for your needs. Live on a golf course? We can create custom screens to help protect your windows from flying golf balls, while reducing glare and energy costs, and increasing daytime privacy in your home. Aluminum awnings are a cost effective, durable and maintenance free. We offer awnings for windows, carports and patios. We are authorized dealers for Steel Shield Security Doors. Security doors by Steel Shield are attractive and strong and are available in a variety of colors and sizes from the most simple to hand-forged custom doors. All doors are custom made. If the frame of your screen is still in good shape but the screen material is faded or worn out you can save money by having them rescreened. We take the old material out and replace it with new material of your need. If the frame is bent you are better off with us replacing it with a new screen. Arizona Sun Screen offers free estimates and we offer convenient drop-off service where in most cases we can have your screens repaired by the next day. If you are a do-it-yourselfer, you can purchase screening supplies or tools in our retail store, located at 15802 N. Cave Creek Road, Unit 1.